Afghanistan’s Mineral Wealth: Prosperity or Curse? Without aggressive action, the mineral-rich country could fall victim to the resource curse. The newly elected Afghan government faces the daunting task of preventing insurgents and factional militias from exploiting the country’s natural resources. To the extent that abundant natural resources can usher in endemic corruption and conflict, the resource wealth of some nations has been labeled a “curse.” At an event hosting Wahidullah Shahrani, the former Afghan Minister of Mines, David Cameron remarked that caution must be taken to avoid a situation similar to that in countries like Liberia, where there has been a failure to use its considerable mineral wealth to stimulate sustainable economic growth, principally due to an entrenched culture of corruption. Cameron mentioned on the other hand Chile and Norway as examples of countries for which abundant natural resources generated substantial development in domestic infrastructure. The current illegal extraction of rubies and emeralds by criminal networks in some provinces suggests that Afghanistan is already at risk of falling victim to the resource curse. One major challenge confronting Ashraf Ghani is the wresting of control of the nation’s mineral wealth from criminal networks, which aim to seize resources not only to line their pockets, but also to enable them to secure political power. A striking example of the extent of destruction that can result when the proceeds of resources fall into the wrong hands is Angola, where criminal diamond syndicates engaged in direct arms-for-diamonds transactions with guerillas, who used the weapons to wage civil war, claiming the lives of hundreds of thousands of innocent people and displacing many more. This is not a reality that is limited to a particular region, but history across the world has proven that such a “curse” is a real risk in resource-rich nations. It is fundamental that Afghanistan’s aspiration to develop a strong economy is pursued concurrently with strengthening the country’s legal system and the rule of law. At present, however, certain sectors, such as mining and hydrocarbons, lack a regulatory environment that can fully support investment. In a recent interview, Daud Saba, the newly appointed Minister of Mines and Petroleum, emphasized the importance of legal certainty and accountability. It may be necessary for the government to establish an institution comprising legal experts that, in addition to overseeing the review and recommendation for reform of legislation, can ensure that the relevant legislations promote investment efficacy in the nation’s natural resources. Legal development and reform are essential in ensuring that a “resource curse” scenario does not play out and that the legal regime is conducive to foreign investment. The endemic corruption in Afghanistan is a further obstacle to attracting investment in the minerals sector. In a recent Corruption Perception Index, Afghanistan ranked as the third most corrupt country in the world. 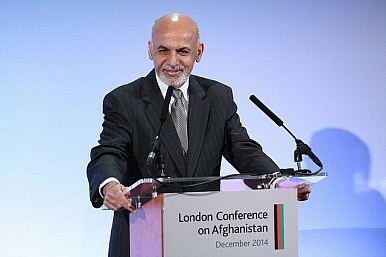 Some commentators have gone as far as describing the scale of institutionalized corruption in Afghanistan as an “economy within an economy.” Recognizing that corrupt institutions enable the resource curse paradigm, Ashraf Ghani has pledged to tackle corrupt practices at all levels – publicly stating his willingness to prosecute even members of his own administration if found to be involved in corruption. Moreover, the country’s candidacy for the Extractive Industries Transparency Initiative (EITI) is a positive move towards dispelling corruption and promoting transparency within the natural resources sector. To avoid the resource curse and establish a sustainable economy, it is essential that the capital generated from the natural resources sector is deployed to shift the country away from its dependence on foreign aid. This would necessitate the institution of a comprehensive economic plan, which could draw upon the four pillars of the proposed National Development Framework created by Ashraf Ghani – human and social capital, physical reconstruction, private sector development, and security. In particular, the plan must be predicated, first, on the establishment of a strong industrial sector, the economic potential of which has yet to be captured, and second, on investment in human capital, not least in order to lay the foundations for the establishment of a strong services sector, particularly in the area of information technology. Simultaneously, the growth of incipient banking and finance sectors, the effective operation of which is vital to investment operations and transactions, must be reinforced. Ultimately, for the Afghan economy to flourish and achieve long-term sustainable growth, the government must not only be proactive in implementing and maintaining institutional safeguards to avoid the resource curse, it must also ensure that the revenue generated from mineral resources is invested strategically and effectively. If the recently elected Afghan government overlooks these necessary precautions and rushes to secure foreign investment, it could lead to the perpetuation and deterioration of the status quo. Given that the newly elected government is still in a state of infancy, it would be advisable for the opening up of the minerals sector to be preconditioned upon the establishment of the legal, institutional and financial infrastructure necessary to circumvent the subjugation of Afghanistan to the faith of numerous other underdeveloped nations around the world that have fallen prey to the notorious curse. Will Afghanistan's Minerals Shape Trump's Policy Toward the Region? Afghanistan's mineral wealth could help kickstart the economy, but beware of the resource curse. The Afghan Endgame: What, When, and HowThe Afghan National Unity Government’s ‘China Card’ Approach to Pakistan: Part 2In Afghanistan, Talking and Killing Continue in TandemWhat Did the Latest US-Taliban Talks Accomplish?Will This Man Be Afghanistan’s Next President?